Muammar Gaddafi named Richest Man of the 21st Century – Ila el amam! October 20, 2012 – Who still believes in the genuineness of the foreign-orchestrated Libyan “February 17 revolution” should take a look at the list of the world’s 25 wealthiest people of all time, published by the Daily Mail on October 15. The first person on the list who is born in the 20th century and lived in the 21st century is nobody else than a poor Bedouin from the Libyan city of Sirte who used to live in a tent; his parents even lived in a tent until their death. He led a quite simple life himself, as you can see in the video below. Still Muammar Gaddafi, who freed Libya of the corrupt monarchy of King Idris Senussi during a bloodless coup in 1969, managed to end up on the 8th place at the list, before famous names such Bill Gates and Henry Ford. The list, based on an October 13 publication of Celebrity Net Worth (CNW), claims Gaddafi had “a secret net worth of $200 billion” before “his capture and death in 2011″. Being known as a propaganda outlet, the Daily Mail builds on stories of the Gaddafi family’s extremely luxurious lifestyle, which stories have been circulating widely in the Western media, especially after the beginning of the American-European war against the sovereign country in 2011. In an earlier article, CNW claims that above the reported $200 billion, “it’s believed that Gaddafi had billions of dollars worth of gold hidden in Libya, which has yet to be discovered”. Libya also contains the largest known oil reserves in Africa and prior to the imperialist war and ongoing NATO-occupation of the country, 1.5 million barrels per day were being produced. The Daily Mail propaganda article claims that a plane containing “various luxuries including a jacuzzi” which allegedly was found by a BBC News reporter in 2011 proofs that Gaddafi robbed his people of Libya’s wealth while living in luxury himself. It therefore will be interesting to take a look at the actual everyday life of the richest man the 21st century has known so far. The Libyan Arab people assembled in the General Conference of the People’s Congresses, the People’s Committees, and the Professional Unions […] support the march of the Revolution towards complete popular authority and consolidation of the People’s Society where only the people control leadership, authority, wealth, and arms to realize the Society of Freedom. In practice this meant that a part of the money from the Libyan Jamahiriya’s oil revenue was directly deposited into the bank accounts of all Libyans. The country officially attained the highest standard of living in Africa and the Libyans benefited from many advantages such as free electricity, no interest on loans, free education and medical treatments and $ 50,000 for all newlyweds. Therefore, the title Richest Man of the 21st Century as well as being 8th on the list of the world’s 25 wealthiest people of all time is actually misleading since all wealth belonged to the Libyan people. Gaddafi, who according to CNW “built his massive personal wealth thanks to a violent and domineering control over Libya’s natural resources”, also initiated the construction of the Great Man Made River, often referred to as The Eight World Wonder and the Largest Civil Engineering Venture in the World. The project made fresh water flow from an enormous ancient aquifer, deep below the Sahara Desert, through 1200 kilometres of pipeline to the north where 90% of the Libyan people lived. The Great Man Made River used to deliver about one million cubic metres of pure water per day to the cities of Sirte and Benghazi, but water pumping stations stopped operating when their electricity supply was attacked by NATO in 2011. Contrary to what the corporate media want us to believe, the generosity of the so-called Richest Man of the 20th and 21th Century was boundless – and not only towards the Libyan people. He also connected the entire continent by telephone, radio broadcasting, television and several other technological applications and supported organizations and political parties such as the ANC in their fight against Apartheid. 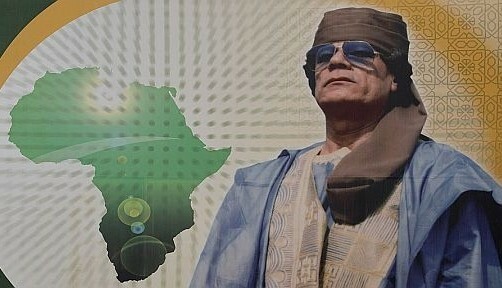 Another giant thorn in the eyes of the American-European aggressors were the three financial key projects initiated by Gaddafi: The African Investment Bank in Sirte, the establishment of the African Monetary Fund which was supposed to be based in Cameroon, in 2011, and the African Central Bank in Nigeria. Gaddafi believed that “the economy of any country which relies on the slavery of blacks is destined to descend into hell the day those countries awaken” – and the Western powers knew too well that as a result of Gaddafi’s revolutionary leadership the African continent was about to wake up and free itself from political, economic and social slavery. With the so-called Richest Man of the 21st Century now being ousted by desperate powers of the Western bankrupt countries, “new democratic” Libya is merely ruled by armed gangs, its resources are stolen by the occupiers and the NATO-installed regime is increasingly criticized by both “rebel” and Jamahiriya supporters. The below late 2011 video shows the wiped out “pro-Gaddafi” town of Tawarga, whose citizens were given thirty days to leave by the so-called Misrata brigades that ransacked the area – if not, they would be conquered and imprisoned by the U.S. and NATO oppressors. So every single one of them has left, and they will never be allowed to come back, a rebel officer told the Telegraph. But not so surprisingly, the Daily Mail and the Celebrity Net Worth are silent about that.